Three years ago I was in Haarlem, Netherlands, watching a televised debate on climate change. For a few moments I felt I had bent my balance: something was bothering me, but I could not figure out what it was. And then I realized that the debate was not about the existence of climate change – as it would have been here in the US – but rather, how much government should be involved in crafting responses and solutions to climate change. The concept of “believing” in climate change is an odd one, and indeed with seemingly half the country on fire, or out of electricity due to a massive storm followed by a heatwave, polls have shown an uptick in the number of believers. But the problem is not one of faith: Mother Nature cares little whether you believe in climate change. The real issue is the fact that climate change is posed as a question in the first place, and its continued questioning comprises a tremendous ongoing victory for the titans of the oil economy. After all, when was the last time someone asked if you believed in gravity? Facing the reality of climate change is an important step. 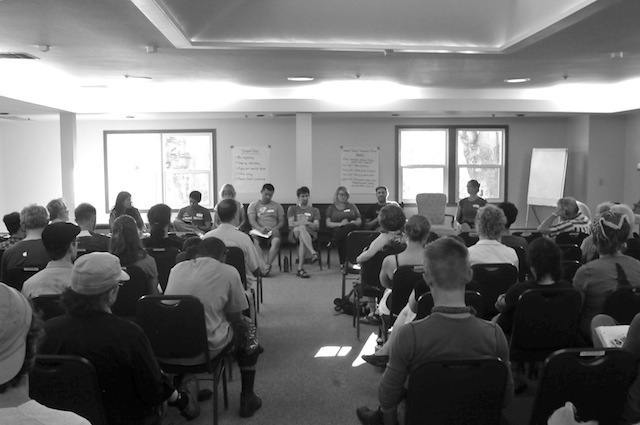 On July 11, over 80 people gathered in the Stark Street Friends Meeting House to discuss and implement strategies for dealing with climate change, or more accurately, its results. 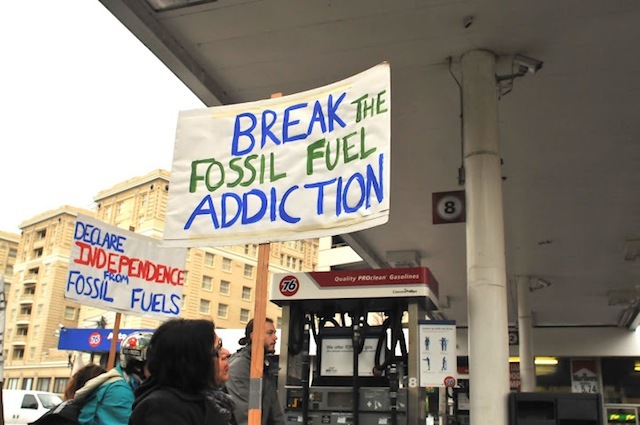 In particular, the focus was upon how we in the US – the foremost consumers of products contributing to climate change – can assure justice for those who have contributed little to the problem, but because of the legacy of European and US imperialism, lack the control of resources, or any resources at all, to adequately combat the problem. 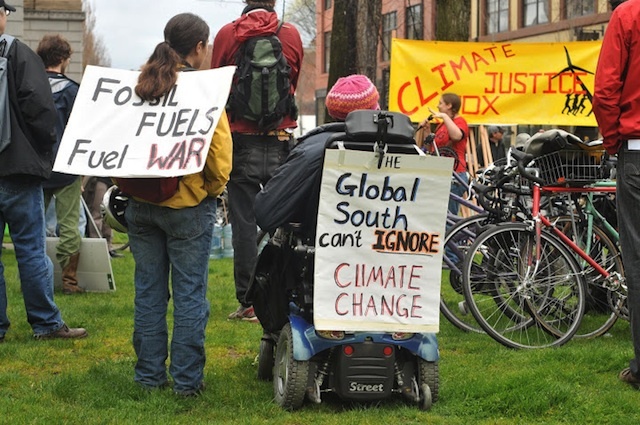 A worldwide problem requires a worldwide solution, and for this reason, people came together in Portland to discuss how local organizing efforts can be part of a larger movement to solve this ecological crisis. The forum began with six panelists, most from grassroots organizations, talking about the lens through which they viewed climate justice. Ian Wallace of the Parasol Collective gave a brief synopsis of how increased carbon emissions warmed the Earth, and talked about the self-reinforcing feedback loop in which melting ice caps resulted in a cycle of more heat being absorbed by the blue ocean instead of reflected by the white polar caps. But what is to be done? Kari Koch, who recently attended the People’s Summit in Rio – held at the same time as the Rio +20 United Nations Conference – cast a jaded eye on the Green Economy which she said was being led by the same corporations and institutions that caused the problem. For example, Koch noted how Coca-Cola may now package its soda in bottles with ten percent less plastic, but only in an effort to make the consumer feel better about purchasing a product that continues to reinforce the free market principle that everything – including air, water, soil, and DNA – can be bought and sold. Brian Frank of Rising Tide agreed with Koch, adding that the green economy is “a framework of false solutions” such as “clean coal”. These so-called solutions not only cover up the existing problems, but also create more problems. Frank talked about ethanol as an example. Though providing an alternative to fossil fuels, it also results in deforestation and an increase in the cost of food. Thus, like nuclear power and water biomass, ethanol is not the win-win situation its supporters claim. Frank closed by emphasizing the importance of focusing on the root causes of climate change as we seek solutions. It is imperative, he said, to keep fossil fuels in the ground, keep resources under local control, and recognize human rights and the injustices committed by the wealthy as they extract natural resources from other peoples’ lands, leaving it devastated when the tap runs dry. What does the green economy look like to those who cannot afford the steep entrance fee of solar panels or a Prius? Erubiel Valladares Carranza II, an organizer with Pineros y Campesinos Unidos del Noroeste (PCUN) observed that compared with the rest of the world, the US exists as a “whole different reality” because our wealth affords us the opportunity to purchase things others can only dream of. It is going to be difficult, he said, to tell people that climate change means they are not going to be able to have the things that advertising has seduced them into coveting. To Carranza, the solutions to climate change must be preceded by solving social problems. The two are intertwined, and Carranza, echoing Koch and Frank, emphasized that changing technology will not solve either problem. A green economy does offer some benefits. Barbara Byrd of the AFL-CIO said that a Clean Energy Works program had helped make her home more environmentally friendly and in the process employed five laborers from a minority-owned business. Byrd now enjoys a reduced carbon footprint and smaller electric bills. Also a plus is the fact that the Clean Energy Works laborers received a family wage and good benefits. Byrd emphasized that we cannot just talk about green jobs without ensuring those jobs deliver higher employee standards, like Clean Energy Works does, as a result of 8 months of negotiations that led to a “high road agreement”. After these short presentations, the audience broke into small groups, each with a focus on a different aspect of climate justice. During group report back it was clear that the ideas surrounding problems, solutions, and most importantly, action to bridge the gap, were lengthy and daunting, but not impossible. As history has shown us in the fight to end chattel slavery, women’s suffrage and the extension of civil rights, just to name a few, the impossible often becomes possible. As ever it comes down to working together, to solidarity. Written in bright red letters on one of report back papers were these words: “Your freedom is wrapped up in my freedom.” Presented with a global problem that requires global solutions, that Truth has never been more evident.